We have the best price on this item if you call 800-579-0580. When working boat shows, we get dozens of walk up testimonials regarding the suprising performance of this product. Many say they don't use it because of the price then they look at the actual price to see it's really not that expensive. The bottom line is that this product will allow you to get the full power potential out of that motor even at LOW speeds - which the OEM oil doesn't even come close! AMSOIL HP Injector Synthetic 2-Cycle Oil is a precise synthetic formulation that exceeds the lubrication demands of modern two-cycle engines. It contains premium synthetic base oils and MAX-DOSE additive system, providing superior performance in direct fuel injected (DFI), electronic fuel injected (EFI) and carbureted outboard motors, as well as other recreational two-cycle equipment. - A recent local testimonial here in Sioux Falls (a customer of mine) noted that within his first use of the HP Injector 2-Cycle Injector oil, he measured increased compression and power. Something he has never experienced with other oils. We get many testimonials with this product.. Most related to low RPM use and reduction in downtime. Botton line - your OEM oil is not serving you. Amsoil is made custom for marine applications and tested just out their back door on Lake Superior! HP Injector is a precise synthetic formulation that exceeds the lubrication demands of modern two-cycle motors. Today's two-cycle outboard motors operate at higher temperatures and at leaner oil and fuel ratios than older motors. This difficult operating environment requires proper lubrication technology to keep motors running long and strong. 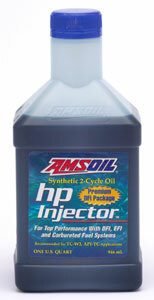 HP Injector is a premium lubricant engineered with AMSOIL synthetic base oils and MAXDOSE advanced additives. It contains up to 30 percent more additives than other TC-W3 two-cycle oils for "super clean" operation. And because AMSOIL synthetic oils are more durable, they are perfect for lean mixture operations. In addition, this AMSOIL exclusive product produces low smoke and odor and has low aquatic toxicity properties, making it ideal for boats. HP Injector improves engine life. It prevents deposits that cause ring sticking and ring jacking (carbon build-up behind the ring, forcing it outward), a phenomenon that occurs in modern DFI outboard motors. HP Injector prevents wear. It has excellent lubricity properties and provides a good lubricating oil film, protecting pistons and bearings. HP Injector prevents rust, an important feature where motors are subjected to water. HP Injector provides superior performance in direct fuel injected (DFI), electronic fuel injected (EFI) and carbureted outboard motors, as well as other recreational equipment. Use as injection oil or as 50:1 pre-mix (2.6 oz. per U.S. gallon of gas) where NMMA TC-W3 or API TC oils are specified. Compatible with mineral and synthetic TC-W3 type two-cycle oils, however, mixing two-cycle oils should be minimized.